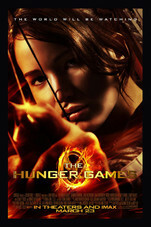 Rated PG-13 for intense violent thematic material and disturbing images - all involving teens. Like the select participants of its savage sport, The Hunger Games stands triumphant, if scarred and a bit wobbly from the contest. Again and again Katniss rescues herself with resourcefulness, guts and true aim, a combination that makes her insistently watchable, despite Mr. Ross's soft touch and Ms. Lawrence's bland performance. If, as the ads suggest, the whole world will be watching this, viewers will likely be satisfied with what they see. If the series's legions of fans miss a detail here or a sub-plot there, they'll still recognize its bones and sinew, especially in Jennifer Lawrence's eagle-eyed heroine Katniss Everdeen.